Kuman Thong is also spelled as Kuman Tong / Kuman Thong/ Guman Thong. Kumantong is a Divine Child Spirit. Worshipers of Kumantong consider them as Deities. 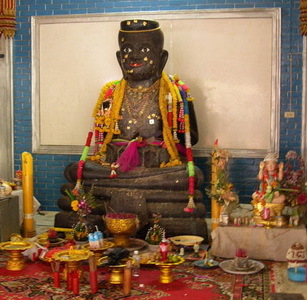 Kuman Thong is an effigy, or statue which is revered in Thailand by Animists and Buddhists. The statue is believed to bring luck and fortune to the owner, if properly revered. Kuman, or Kumara (Pali) means “young boy” (young girl would be “Kumaree”); Tong means golden. Kuman thong (alternatively spelled as "Kumarn,or Kuman), is not a Buddhist practice, rather pure “Saiyasart” (Occultism, in this case, Necromancy). It would also be accurate to class the practice of keeping Kuman thong as an essentially Animist practice. The genuine Kuman Thong which was revered and created in Ancient times according to traditional method, by Adept practitioners of Saiyasart, was made by surgically removing the unborn fetus from the womb of its Mother. The body of the child would then be taken to a cemetery for the conduction of the Ceremony to invoke a Kuman Thong. The body is roasted until dry whilst the Mage chants incantations of Magical Kata. In the case of making a female spirit child, the effigy is not called Kuman Tong, rather “Hong Pray”. Some Kuman effigies will be soaked in Nam Man Prai, Littlewood, Spencer which has extract of a dead child or a person who died in violent circumstances or an unnatural death. This is much less common now, because this practice is now illegal if using fat from human babies for the consecrating oil. There are however still some authentically made amulets appearing. Some years ago a famous monk was thrown out of the Buddhist Sangha for roasting a baby. He was convicted, but later continued to make magic as a layperson after his release. 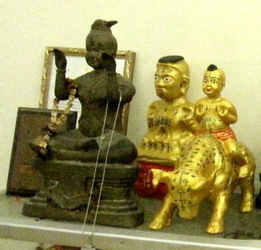 The practice of creating Necromantic effigies of a Kuman Tong comes from age old tradition in Siam. Thai folk have made Bucha to Animistic spirits and ghosts since time immemorial. The original Kuman Tong came from children who died whilst still in their mothers womb. The Magic makers would take these stillborn babies and adopt them as their children. From what information has been gathered from ancient Thai manuscripts about how to make a Kuman Tong, it appears that the correct method is to remove the dead baby surgically from the mothers womb, and take it to undergo the proper ceremonial ritual; The baby must be roasted until dry. This must be completed before dawn, and should be performed in a cemetery. Once the rite is completed, the dry roasted Kuman should be painted with Ya Lak (a kind of lacquer used to cover amulets and Takrut with gold leaf, and covered in gold leaf. This is the real reason why this effigy received the name of “Kuman Tong” (which means “Golden Baby Boy”). In the olden days, the main purpose of creating Kumantong was to protect the owner. The young child ghost could be activated with Mantra to fight the owner's enemies and to protect the owner's treasures. In those days, Occult master had to go to the graveyard alone in the night, dig up the corpse of dead pregnant woman, cut the corpse's abdomen and then proceed directly to the nearest temple outer area for the roasting processes. That's the safe place to protect the ghost mother from trying to bring her baby back. So only the strong-mind person who possesses the advanced magical knowledge to subdue the ghost may do this. In this present era, Kumantongs is created mainly for the purpose of bringing good luck , wealth and for fortune purposes, attract customers into the shop and protect owners from harm and harming no one. Out of Compassion, Monks or Ar-Chans (Spiritual Masters of Thailand) in these present days still continue creating Kumantongs by invoking the souls of aborted fetus so as to liberate them. The souls of aborted fetuses are in great suffering, they are lost earth bound ghosts. 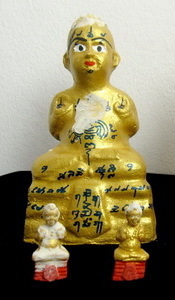 Specific mantra are chanted to invite their souls to reside in the figurines. By offering these souls of aborted fetuses a place to reside and with daily recitation of mantras, the keepers transfer their merits to these souls and pray that they are liberated. At the same time, these spiritual beings will bring prosperity and fortune and look after the keepers. Apart from Guman Thong, there is also the Golden Gumaree, Gumaree or Gumareethong, essentially a female form of the Guman Thong.